It was December ‘08. And on a trial to make a boring Sunday lively, I asked my aunt about the possible nearby locations. She told me of this church where some scenes of the almost legendary movie Amar Akbar Antony was shot. I said fine. So, we started in a cab and dropped near the church. As said earlier it was December and the church was in full swing to get ready for Christmas celebrations. This is a church and school attached together. Begun at 1928 and was shifted to this building at 1942. The entrance of the church itself impressed me a lot. 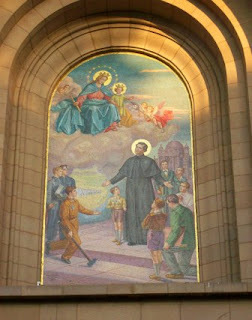 It was tall structure with painted glass of St. Don Bosco (aka John Bosco – 1815 to 1888) surrounded by kids and being blessed by Baby Jesus and Mother Mary. 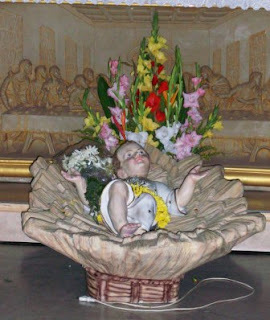 As I went inside, was this centrally placed, larger than life sized doll of Baby Jesus on the floor. 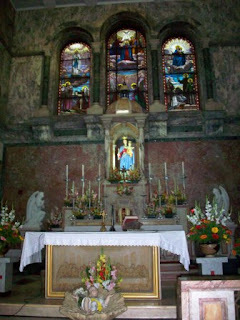 Atop was the altar of Mother Mary holding Baby Jesus. The central table had Leonardo Da Vinci’s Last Supper encraved on it. Above the altar near the roof, were these amazing stained glass art. The crib was beautifully setup with half-life-size dolls. The whole decoration was so pleasing and elegant. Not to forget the efforts taken by the school kids to imitate fire with little fans set up with orange lights and butter paper sheets. What makes a trip to the local church interesting? Colorful idols? Colored glasses and high ceilings? Religion and its insulated stories? I never asked myself those questions honestly. May be I want to know your thoughts. Generally something new and ONLY devotional does not catch my fancy. There has to be something more in it. Or it has to be a nature trail. Very nice pictures and diversity! I love stained glass and the way the different light at varying times of the day changes the colours. Wonderful. These pictures are great, you captured the images and colours really well. It's nice that you could take photographs, lots of churches now don't allow it. 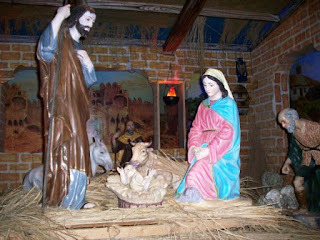 I always love the nativity scenes in churches. My favourite time of year in the religious calendar. Just don't like the weather here in December. love the architecture and artwork in old churches...nice post. That's absolutely true... The whole appearance of the church's interior completely changes with the play of light with the stained glass panels. I like the silence in the not so famous churches...it would be so serene, especially if there are colored glasses and no artificial lights...n yeah, glad you lykd da pic, juz one of those dez to eat time! This post reminded of my visits. Altar looks beautiful n I would always be in love with those stained glasses. I've been there! It's a very holy divine and pleasant place! Thanks for sharing the pics and info! Very true... Roads less travelled and places less visited always has a sense of tranquility in it. I like the art work. Photos and descriptions are beautiful. 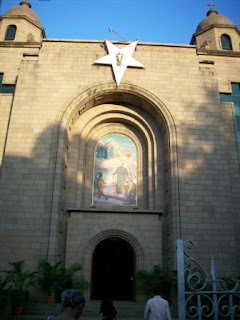 Superb pics & description of Don Bosco church. 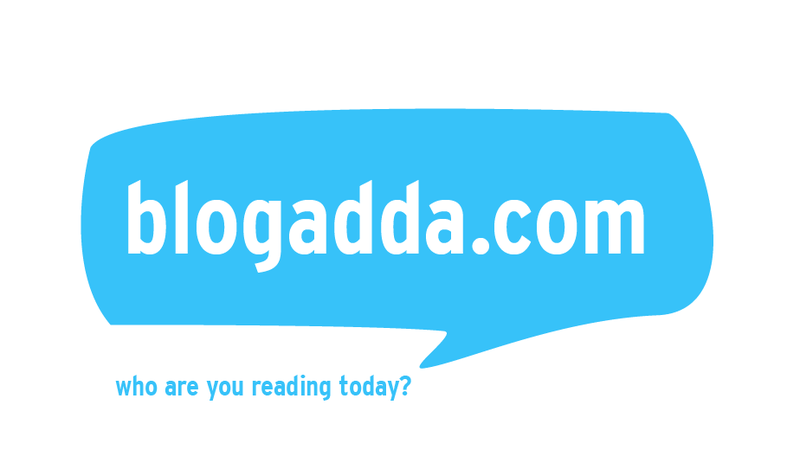 Incidentally you gave me the first blog award a couple of months ago. At that time I was not aware that I am supposed to display the same on my side bar. I have now placed it on my side bar. Thanks once again for your kind appreciation.I really value it! 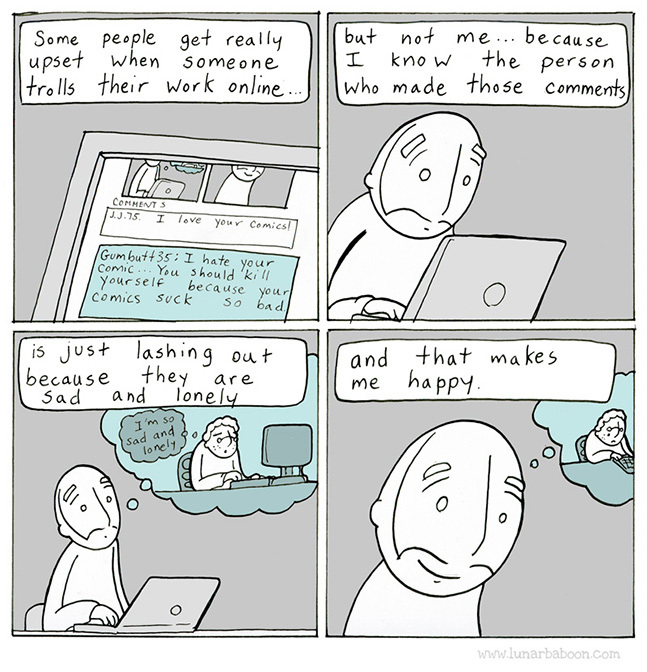 Beautiful post. Loved the painting and sculptures. Nice to know about the history of this church. Thanks dear. Do visit the church on some weekday, so that you can enjoy the art and architechture of the church which is impossible on an Sunday. Thank u. And, very true. It is modern. Ancient things that have withstood everything till date are the ones that fill me with awe..